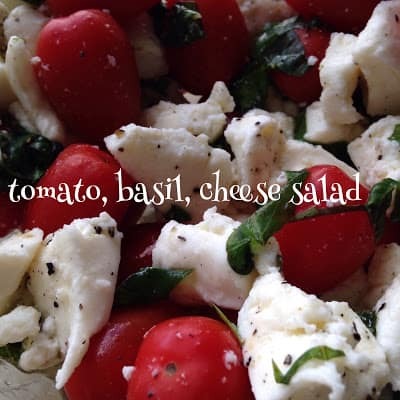 Tomato, Basil and Mozzarella Salad or most often called Caprese Salad is simple and yet always delicious. This classic salad is the perfect summer-time salad that showcases vine-ripen, garden fresh tomatoes. Besides a BLT, this salad is our favorite way to enjoy summer-time, fresh tomatoes. 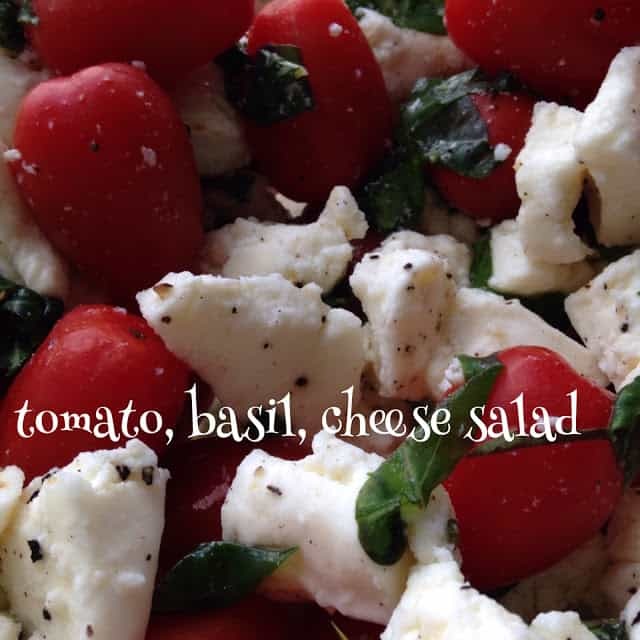 In the summer, when fresh garden tomatoes are ripe and lined up like round soldiers on my kitchen window sill, I grab a big glass bowl and make this salad. Even though this salad only requires 3 ingredients, there is definitely one rule of thumb when making this salad, Fresh is Best! Use the freshest ingredients you can possibly find. Not necessarily the most expensive ingredients but definitely the freshest. 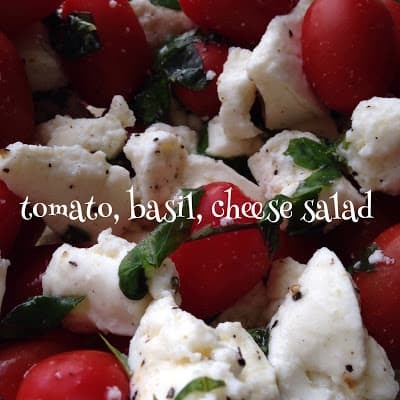 Using the freshest basil, tomatoes and mozzarella cheese, will result in the best salad. Freshly ground black pepper and extra virgin olive oil is a must also. 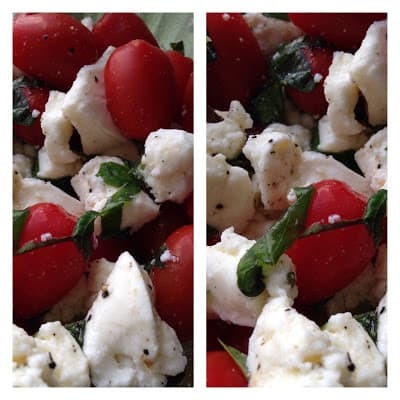 Caprese Salad [kah-PRAY-say] is a simple Italian salad made of sliced fresh mozzarella, tomatoes, sweet basil and seasoned with salt, black pepper, and extra virgin olive oil. It takes its name from southern Italy’s island of Capri in the Gulf of Naples. Like Pizza Margherita, it features the colors of the Italian flag; green, white and red. In Italy, it’s served as an antipasto (starter) not a contorno (side dish). 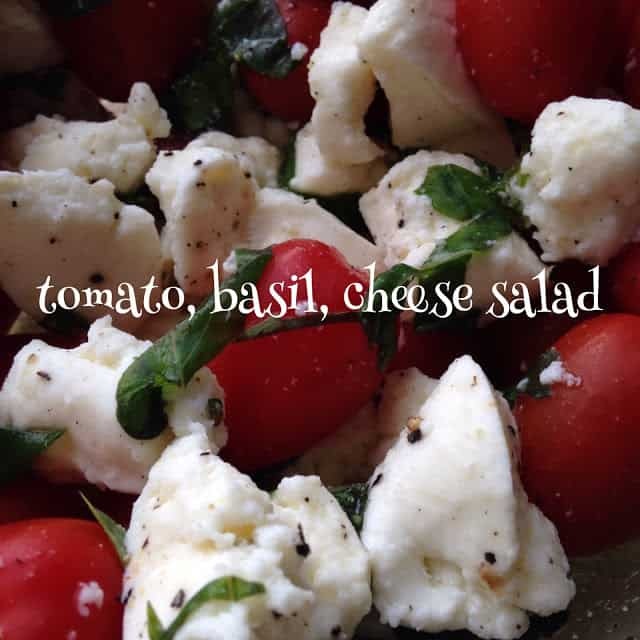 Combine oil and basil in a large bowl, add the mozzarella cheese balls or cubes and season with salt and pepper. Cover and let marinate in the refrigerator for at least one hour. Add tomatoes to oil mixture and toss to combine. Season again with salt and pepper. Grilled Peaches and Pineapple Recipes are a couple of recipes that make for a fast, easy and delicious dessert during the warm summer months.